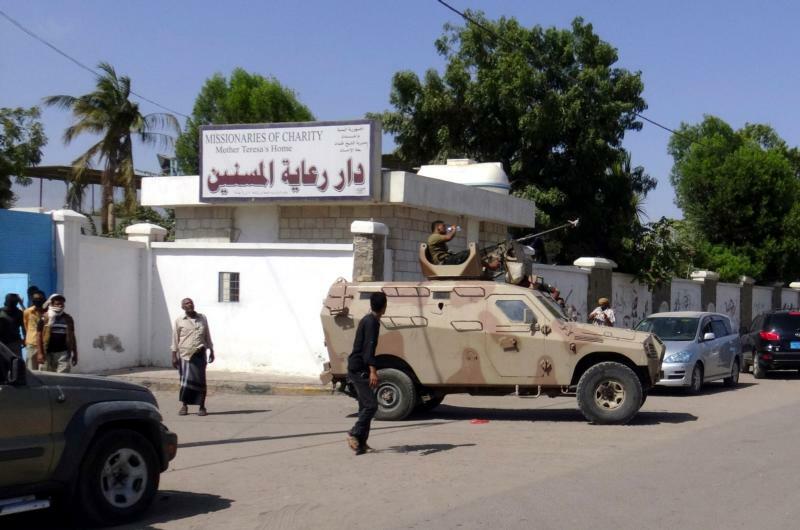 The four Missionaries of Charity and 12 other people were killed by uniformed gunmen, who entered the home the sisters operate for the elderly and disabled in Aden. The superior of the Missionaries of Charity at the home survived by hiding, according to the Vatican’s Fides news agency. Father Tom Uzhunnalil, an Indian Salesian priest who had been living at the home since Holy Family Parish in Aden was sacked and burned in September, was missing after the attack. The sisters and the 14 others killed “are victims of the attack by those who killed them, but also (victims) of indifference, this globalization of indifference that just doesn’t care,” the pope said. Yemen has been experiencing a political crisis since 2011 and is often described as being in a state of civil war with members of the Shiite and Sunni Muslim communities vying for power; in the midst of the tensions, terrorist groups have been operating in the country, including groups believed to be associated with the so-called Islamic State and al-Qaida. Although most Christians have fled the country, a handful of Salesian priests and about 20 Missionaries of Charity chose to stay and continue their ministry. Two of the sisters killed were Rwandan, one was from India and one was from Kenya, the bishop said. Father Uzhunnalil apparently was kidnapped, he added. “The signal was clear: This has to do with religion,” Bishop Hinder said. The bishops also urged the U.S. State Department to issue a declaration that genocide is occurring against Christians, Yezedis and other religious minorities in the Middle East. So terribly sad! They surely went straight to heaven.